Know the impact your foods have on your body. Without all the confusion. What do those nutrition facts mean on the labels you see on the side of your favorite cereal? What are trans fats? Saturated fats? How do these relate to you? Bon'App demonstrates the impact of your foods on your daily diet in a language that is simple and easy for everyone to understand. See your calories, sugar, salt, yuk fat*, fiber and protein levels—either for the day or for a certain food. *Yuk Fat is a Bon'App term for the total amount of trans and saturated fats. A comprehensive food database with reliable information. Bon'App uses one of the largest food database available to provide you with nutritional facts for over 140,000 food items. It's about your health, not about dieting or weight loss. 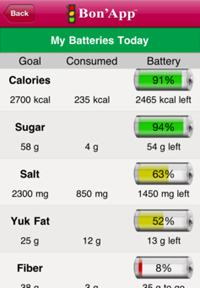 Bon'App makes you aware of your eating habits and to make changes if you're not meeting your nutrition goals. Our sole goal is to lead a healthier lifestyle by empowering you to make healthier food choices. Partner with an advisor to help you meet your goals. Registered advisors (health coaches, nutritionists, dietitians, personal trainers, etc.) can sign up for Bon'App, and users can select a registered advisor to help you stay on track with your nutritional goals. Try out Bon'App for yourself! Check out http://www.bon-app.com to find out how to download.